A couple months ago, a good friend (Amy) called to ask if I would help her with a baby shower she was hosting, for a mutual friend. I quickly agreed, until I heard the shower date. The baby shower was going to be the day after my daughter’s candy party and I realized I couldn’t really guarantee if I was still going to be walking after that day! So I asked what the theme and colors were going to be and started thinking of things I could help with ahead of time. She said the party theme was “She’s about to POP”. I instantly thought of an amazingly original party I had recently seen with that theme… just by chance the same place Amy had seen the idea. Here is the original, She’s about to POP baby shower from My Insanity. The colors of the shower were going to come from the colors of some cute tin buckets Amy had bought for the shower; bright pink, bright green, bright blue and purple. 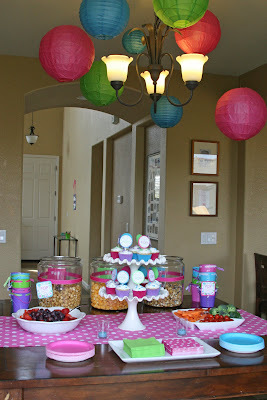 Although the shower was for a baby girl to come, the mommy is not really a baby pink kind of girl (she’s more fun), so the colors were chosen to reflect her style a bit. With the theme and colors in mind, I got to crafting! I designed custom water bottle labels (I’ll be sharing the how-to’s in an upcoming post), soda POP labels, cupcake toppers (which read, “She’s about to POP), and tags for the favors (which read, “Thanks for POPPING by!”). In addition, I made a sign to welcome guests as they entered the home which read, “Stephenie’s about to POP”. I made the sign on a 12″ x 12″ scrapbooking page and I left plenty of open space, so guests could sign their names and it could be used as a keepsake for the shower. I also got to work on some labels for the food. Amy and I had decided on a fun and simple snack menu of POPcorn (in three flavors- caramel, cheese and chocolate/caramel), cupcakes, and some fresh fruit and veggies (with labels that read “POP something healthy”). Amy also put together some fun games that included a couple POP quizes, and tested our knowledge of POP music. 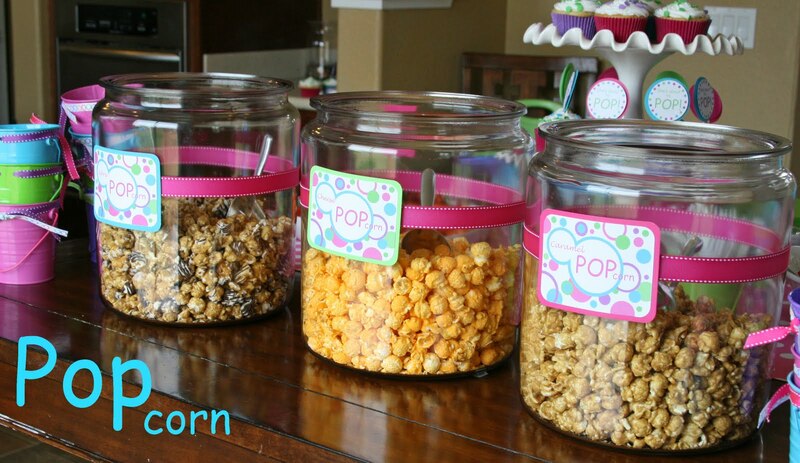 Here’s the yummy POPcorn (and on the left you can see the tin buckets guests filled with the popcorn). Pretty drinks- water and soda POP (above), and the food table set up (below). 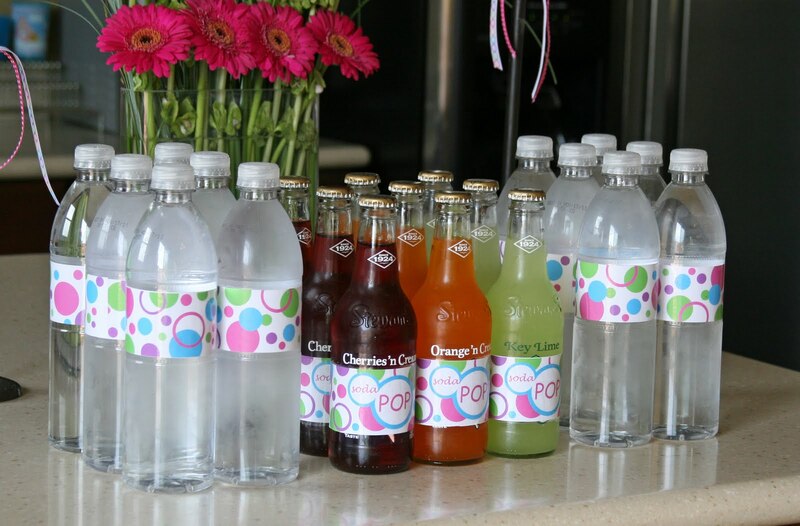 How-to’s for making your own custom water (or soda) bottle labels HERE. All in all, it was a fun day to shower the mommy-to-be with love and gifts, and a good excuse to spend the afternoon with friends. Do any of you feel a sudden craving for popcorn? Love this theme! Fantastic details – down to the circles on the clothespins! And I love the bold colors! Thanks Chris! We had fun with the bright colors too! Such a cute idea!! I never thought about all the pops!! 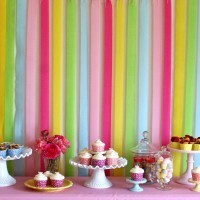 We adored Graces gorgeous party Glory!! Come see how my my nieces' turned out (i put way too many photos of it on my blog!!) when you get a chance. talk soon!!! You did a great job, Glory! I love the colors and tags… you are good, my friend!! What a fabulous display Glory. Beautiful all over..and I have a huger craving for the bowl of fruit right now. Thanks for the help with the shower… I couldn't have pulled it off without you!!! Can't wait to do it again! What an adorable theme and the colors are great!! You did a great job with this theme! Love the color scheme! Hi Glory! We are on a roll lately, finding lovely creatives like yourself! We love what you are doing and would be thrilled if we could write a blog post about you, this of course would link back to your blog, and give your images the "*Courtesy of Glorious Treats" marker. We write a collection of posts called Anchorware Everywhere, which is where your work would be posted. Fabulous work – we are looking forward to hearing from you! Well my name is Alice i'm portuguese and your blog is…FANTASTIC, is so beautiful! Congratulations you did a great job! 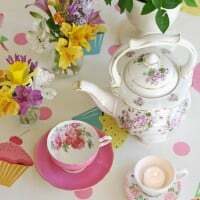 I love your blog and just discovered it. Would you mind if I posted some images from this shower and linked back to you? Jenifer- I really appreciate you asking first. Yes, you are welcome to use a few images as long as you clearly link to my blog. Please send me a link when you have the post up. LOVE LOVE LOVE it all…one of my favorite color combos too! I also couldn't resist posting about your Easter ribbon cupcakes, but if that's not okay, just let me know and I'll remove it. Thanks again! I think you are amazing and I can't wait to see what else you do. Jenifer- Thanks for the links to the posts. I don't mind the extra post, or any future posts you do, as long as you clearly link back to me. (And I like if you send me the link so I can enjoy reading the post too). I LOVE this idea!!! I was wondering how you made all the cute labels and what you did for the invitations? I am planning a shower for my sister n law and this them seems to fit her style perfectly! Thanks for much for posting how you made your water bottle labels. I am wanting to start creating invites, labels, and banners. I noticed you use Photo Shop, can you please tell me what version you use? Jennifer- I just use Photoshop Element 5.0 it's one of the oldest and cheapest versions available! I'd love to have a better version, but I work with what I have! I love the labels on your water bottles. Did you put something on them to make them waterproof? I'd love to use these for my daughter's birthday. i love the gerbera daisy arrangement…do you know the name of the long green flower/greenery? Allison- Thanks, I made the flower arrangements. The tall green flowers/greenery are called Bells of Ireland. There is also Curly Willow in the background, and the Curly Willow was sprouting a bit, so it had a bit on green on it as well. Thanks mate… just dropped by. Will look for BIKE STN when we get to Seattle. Still in Buenos Airies. Oh my goodness this is so perfect!! I found your post on Pinterest and am throwing a shower with the same theme and VERY similar colors next week. Do you have an etsy shop or would you be willing to share some of your printables? 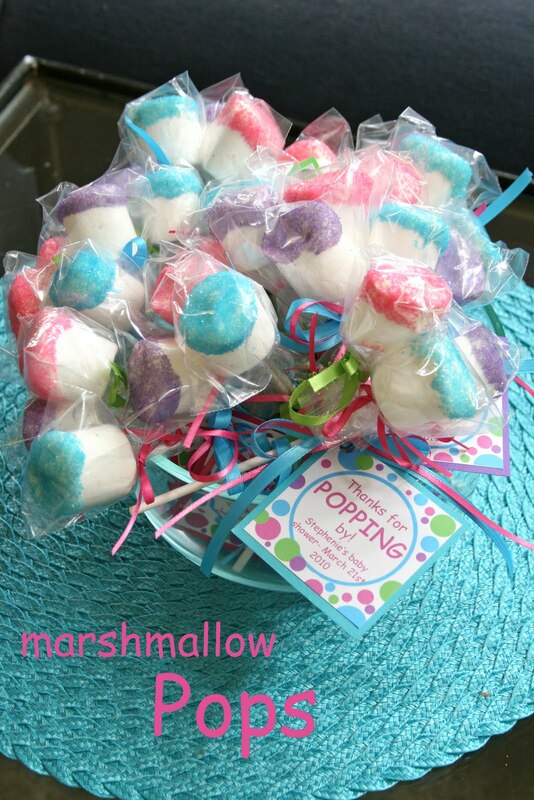 Specifically the water bottle label template and the precious labels from the marshmallow pops? I would VERY much appreciate you help (I am not as blessed with the designing as you are)! Thank you! 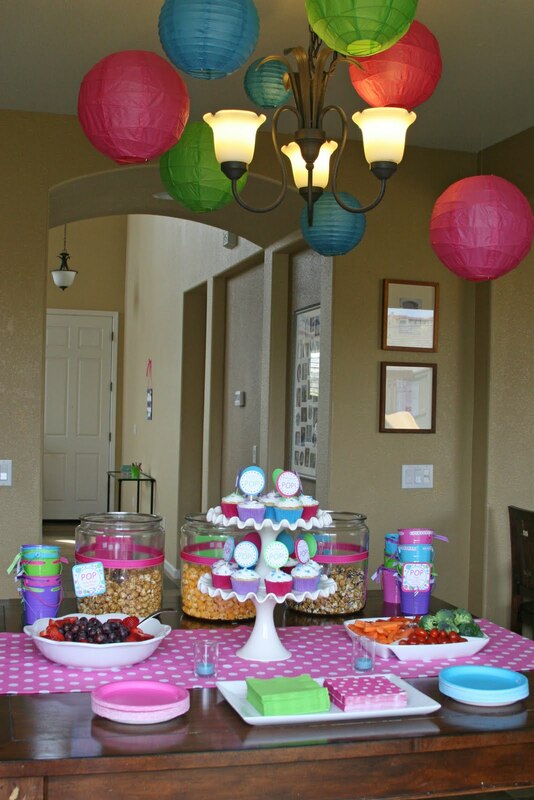 I know I am late to the game on this post, but I recently purchased a load of different colored paper lanterns to use in a "she's about to pop" themed shower … The shower will be thrown at my friends house and I was wondering how you hung your lanterns from the ceiling. I don't want to damage her ceilings by leaving holes from push pins – any suggestions? You are so creative!! I was just wondering, how do you make the labels for the food and thank you laebl’s etc.? I love everything! 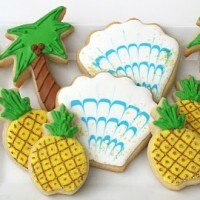 If you still have the templates for the food labels and cupcake toppers please email them to me. Thank you! Love this party!!!! Are you offering a free download of the party printables??? They are darling! Im having my mother a surprise 50th birthday party can you please tell me how you got the wording on the label I’d like to try and make her some water bottle labels and these seem so cute her theme is Zebra Print…. Can You Help with what I would need to do or tell me where I can go to get the information. Hello! 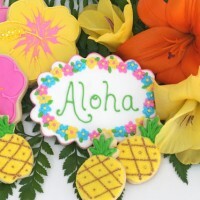 I love the cupcake toppers you use and I”m wondering if you sell the template on Etsy or anywhere else? Thanks!